And, compared to the cost of replacing furniture, plants, carpet, and other personal items that may be destroyed when a dog is allowed to roam a household unsupervised, the expense of a crate is very economical. How Can a Crate be Used to Avoid Accidents? Crate training is proven to be the fastest, most cost effective method of instilling "good dog" behavior. A dog's natural instinct is to keep the area in which she rests as clean as possible. Most dogs are very resistant to being near their own waste and therefore will make an extra effort to control their own elimination when confined to a crate. By the owner encouraging elimination in the proper place immediately after a dog is released from the crate, the pet quickly learns when and where to "take care of business." This is a proven method of house training recommended by nationally known trainers. How Can a Crate be Used to Solve Other Behavioral Problems? Most behavior problems such as destructive chewing are due to the boredom of an unsupervised dog. If allowed to continue the behavior, it quickly becomes a habit that is difficult to change. Dogs naturally want to please their owners and receive praise and love in return. If the dog knows exactly what is expected of her, she will gladly behave accordingly to benefit from it and be rewarded. By using a crate during the owner's short-term absences, the dog is simply not able to misbehave. Instead she will rest quietly in her crate. Dogs generally sleep 90% of the time the owners are away. It's the other 10% that so many things can go wrong. By crating the dog, you are essentially only asking for a small amount of change to the dog's natural schedule. How Can a Crate be Used to Ease Separation Anxiety? Separation anxiety is the number one behavioral problem today. It can be defined as increased fearfulness of the dog after the departure of the owner. This often misunderstood disorder causes loving pet owners to feel they have no other option than to find their dog another home. Dogs are pack animals and are not prepared to cope with isolation. They must be taught how to be alone and reassured that they will not be alone for long. Through positive crate training, the dog's personal den can provide an increased sense of security, which often helps ease stress and stress-related behaviors. Antidepressant medication may curve the behavior but it will not solve the problem. When Can You Start Using a Crate? Immediately! The sooner the better, no matter what age your dog may be. Ideally, a puppy should be introduced to a crate at an early age. In fact, many reputable breeders will already have a puppy familiar with a crate before the puppy is introduced to a new home, which makes that transition much easier for both the dog and new owner. But a dog at any age can be introduced to crate training. Older dogs may view the crate as punishment in the beginning and may need extra encouragement and slower graduated confinement times. Start your training when you are able to be home with your dog. A wire crate is recommended to allow your dog optimum visibility of her surroundings. Your dog will be most relaxed if she is sheltered but still able to view her surroundings without having to get up. She will rest longer and quieter. Wire crates are designed for proper ventilation. Illness can be caused during house breaking if puppies or dogs are forced to inhale urine odors. Complete ventilation will prevent this and many other ailments that can be caused from low ventilation. Wire crates are easy to move and store, and can be cleaned with soap and water. With proper care, a wire crate will last the life of the dog, therefore are more economical than plastic designs. What Size of Crate Does Your Dog Need? When selecting a crate for a puppy, go ahead and get one that will fit the dog's need when she is fully-grown. Precision Pet Products' Puppy Panels allow you to adjust the size of the crate and are available for larger crates while the puppy is growing. The dog should be able to comfortably walk in, turn around and lay down in the crate. Your pet should not feel cramped, but do not use a crate that is too big, that will defeat the purpose of giving the dog the sense of having his own enclosed "den." An oversized crate will also defeat the dog's natural instinct to keep her home clean and free of waste since she may use one end to rest and one end to "go." Where Should the Crate be Located? The crate should be placed in an area that is easy to supervise. Since dogs are highly social animals the crate should be in an area of the household where the family spends most of their time. The crate should not be put in an isolated area. At night, the bedroom is an ideal place for a crate so that the dog can feel the security of being near her owner. Dog owners that are familiar with crate training and its benefits to both people and pets often have two or more crates set up in the house. (For example, one in the den and one in the bedroom.) Wherever the crate is placed, it is important that it not be in a draft or direct heat. Some dogs feel more secure when a towel or blanket is draped over the top and sides of the crate. It is especially important to keep the crate in the bedroom at night while puppies are being housetrained. For successful housetraining, you must be able to hear your puppy cry when she needs to be let outside to eliminate. Each individual dog varies but as a rule a puppy can control elimination through the night as early as three months of age. It is also important to regulate a puppy's feeding schedule so that this can be taken into consideration as to when and how often she must be allowed to relieve herself. The last meal of the day should come at least two hours before bedtime. It is important to establish a timely routine so that the dog's body functions can adjust to when she will be released from the crate. As a dog gets older the amount of time she can stay in the crate can be extended but should never exceed more than six to eight hours. Introducing Your Dog to Her Crate. Important Note: Always take care to remove both collar and tags prior to your dog entering her crate. Allow your dog to explore the crate on her own. You can toss some of her favorite toys or treats inside and show interest in the crate to encourage her curiosity. Leave the door open during the introduction period. NEVER force your dog into her crate and ALWAYS praise her anytime she enters on her own. Soon your dog will enter and exit the crate willingly. 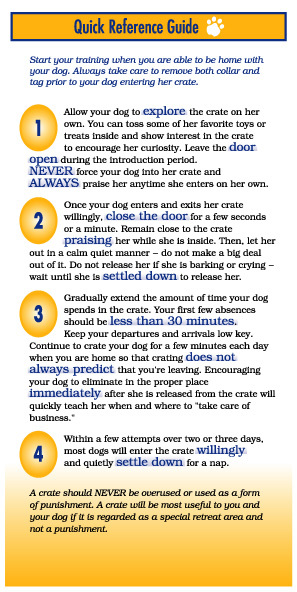 At that time you should close the door for a few seconds or a minute and remain close to the crate praising her while she is inside. Then, let your dog out in a calm and quiet manor, not making a big deal of it. You do not want the exit of the crate to be an excitable moment. 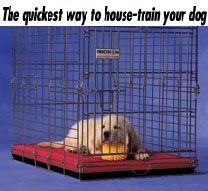 This will make your dog want out of her crate rather than enjoying the time inside. If she barks or cries while inside her crate, reassure her and wait for her to settle down before allowing her out of the crate. You do not want her to associate negative behavior with being released from the crate. Gradually you can extend the amount of time the dog is left in a crate. Your first few absences should be less than 30 minutes. Keep your departures and arrivals low-key. Continue to crate your dog for a few minutes each day when you are home, so that crating does not always predict that you are leaving. Within a few attempts over two or three days most dogs will enter the crate willingly and quietly settle down for a nap. It is natural for your pet to bark or cry when getting used to her new den. Some owners like to feed their dog in the crate, although the bowl should be removed as soon as the dog finishes eating so that it is not in her way. Sometimes this will help gain the dogs trust with a crate. Remember that puppies will need to eliminate immediately after a meal and adult dogs will need to eliminate within 30 minutes. Once the puppy or dog no longer has a habit of chewing, a washable blanket or some other form of bedding can be put in the bottom of the crate for additional comfort. SnooZZy Pet Beds by Precision Pet Products are specifically designed to fit dog crates and come in a variety of sizes. It is very important that the convenience of a crate not be abused. Every dog needs plenty of exercise and should be allowed the opportunity to socialize daily with her human family.